While there may be a common assumption that dads need to throw out their childish hobbies once they become parents, results of a new study seem to indicate otherwise. A pair of researchers from Brigham Young University found that young girls who played age-appropriate games with their fathers were not only healthier and happier than those who didn't, but they also had stronger family connections as well. 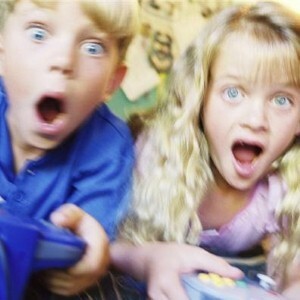 The study, which was released in the Journal Adolescent Health, was conducted by Laura Padilla-Walker and her colleague Sarah Coyne, and focused primarily on the gaming habits of 280 families with children between the ages of 11 and 16, LiveScience.com reports. On average, daughters played video games about once a month, with 46 percent not playing at all. However, those girls who played with their parents – typically their fathers – were less aggressive, less likely to be depressed and better behaved overall. "I think we can encourage more parents to play video games with their kids, especially age-appropriate games," Padilla-Walker told the news source. "It's just another way to be involved with your kids." Interestingly, the results seemed to apply only to girls. Researchers believe that the reason is likely because boys tend to play video games by themselves and typically play less age-appropriate games, such as Call of Duty or Halo. While the findings emphasize the importance of father-daughter relationships, video games should still be consumed in moderation. The Huffington Post reports that as many as 1 in 10 youngsters are at risk of video game addiction.